I created a one layer card for easy mailing. This uses Papertrey Ink "Mini Blooms" stamp set and the sentiment is a mix of Avery Elle "Oh Happy Day" and PTI "Polka Dot Parade #1". I used Hero Arts shadow inks. 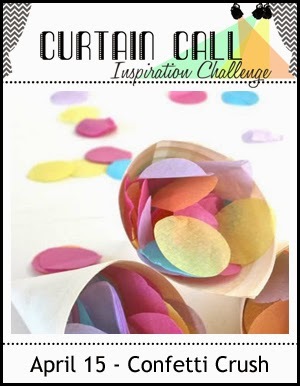 I'm also entering this card in the current Curtain Call challenge "confetti crush". Such a pretty card! You did so much stamping with so many colors of inks!! I'm not that patient. Your fur babies are just too sweet. Give them some Easter treats for me!! Such a pretty card Rachel. Love the darling blooms and the fresh Spring colors. Thank you for playing along with us at Curtain Call Inspiration Challenge.